Strictly speaking, I made my first professional sale when I was sixteen; a short ghost story so abominably written that I now feel that the editor who bought it must have had a sadistic grudge against his readers. Today I will attempt a first here on the blog. Thus far, I’ve mainly reviewed mystery novels, with the occasional foray into the short story collection. I’ve reviewed one film. All of these have been works of fiction, but today, I will write about some non-fiction for a change. But before I do, allow me to give a note of introduction. Back in my pre-Agatha-Christie days (Heavens! Was there such a time? ), I had finished reading the Sherlock Holmes stories and was unsure where to go to next. There were plenty of juvenile mysteries in the library, and I’d read them, but something just seemed to be missing, and soon enough I gave up on the adventures of the Hardy Boys or their female counterpart, Nancy Drew. I turned my attention to Sherlock Holmes pastiches, going through some decent ones and suffering through some incredibly awful ones (one I recall was an abominable rip-off titled “The Prime Minister’s Papers”). 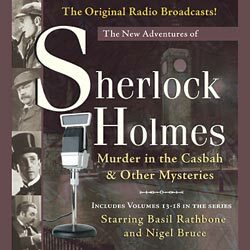 Then, while searching for a DVD about the War of 1812 (a historical period I’m quite passionate about), I chanced across a tape recording of The New Adventures of Sherlock Holmes. I can even tell you which tape it was: The Guileless Gypsy and The Camberwell Poisoners were on the tape I checked out that day. 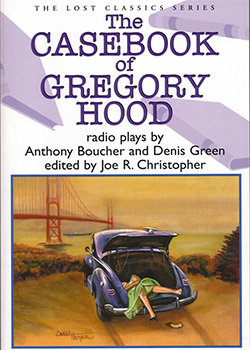 Basically, Anthony Boucher (born William Anthony Parker White) is one of my heroes in the realm of mysteries : his and Green’s radio plays highly influenced my love of mysteries. After I went through my library’s recordings, I was on the road to discovering Agatha Christie (and subsequently, John Dickson Carr). And yet, I knew remarkably little about him: more or less that he was an influential critic, an author, an editor, a translator, and a fellow Catholic. 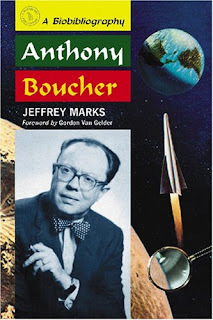 So you can probably imagine my reaction when I found the book Anthony Boucher by Jeffrey Marks. Here at last was my chance to learn more about my hero! I eagerly began to read, and the result is commendable. Marks has come up with a very readable, interesting bio-bibliography chronicling Boucher’s life and crimes. The main part of the book is divided into a few sections: The Man, The Author, The Editor, and The Critic. There, Marks chronicles precisely that— Boucher’s early years, his involvements in the sci-fi community, his incredible work as an editor and critic, etc. All this unearths some really interesting information and correspondence. I learned quite a bit about Boucher. I now recognize in him not only a fellow Catholic and fan of John Dickson Carr, but also an asthmatic. (My own asthma, thank goodness, seems to have more or less gone away— I haven’t been bothered by it for about five years now, and prior to that had six or seven years’ rest.) You get to learn a lot about Boucher, the man: about his devotion to his wife, Phyllis (there is a wedding photo on page 19 that I absolutely adore), and about his various health problems which kept him from being as productive as he would have liked. And some things never change— Boucher's genius (for it can only be termed that) did not earn his fellow classmates' respect, but derision behind his back. Marks takes a look at Boucher’s output of work in this book, including some unpublished adventures that are going to haunt me for years to come! He looks at Boucher’s role as editor and critic and even chronicles something I wasn’t expecting to see: Boucher’s involvement in the Dell Great Mystery Library (of which I have only number 17, Death of a Ghost by Margery Allingham). Overall, this makes for a highly readable work, but I have one or two criticisms about it. The first is a rather harsh one: Marks gives major, major hints to the solutions of The Case of the Seven Sneezes and Rocket to the Morgue. Although I can see why he’d bring up the point about Rocket to the Morgue, the stuff about Sneezes could have easily been excised and you wouldn’t lose anything. This left me very disappointed, as Marks had been careful with his other pieces not to give the game (or a large part of it) away. My disappointment was compounded by the fact that I’d just located Seven Sneezes in a bookstore after a considerable time wanting to read it— now I know the major twist. I highly dislike this kind of irony. My other major criticism (a relatively minor one) is that due to the book’s structure, there are some uncanny moments of déja vu. For instance, when Marks talks about Boucher’s methods as a critic, I could’ve sworn I’d read this before— but how could I? I hadn’t skipped ahead or anything of the sort… After looking back in the book, I discovered the identical anecdote repeated in very similar wording about 3”x5” cards. ↑ That right there happened. The sentence never went anywhere, and we’re left with a promising start to a sentence about Boucher’s criticism. Still, these occurrences are far between and low in frequency, so it isn't a fatal flaw, merely a briefly distracting one. Jeffrey Marks has written a very good book chronicling Anthony Boucher, and I appreciate the work, as I now know a lot more about one of my personal heroes. There is a wealth of information here about everything from the fall of Old Time Radio to the formation of Mystery Writers of America. For those who want to torture themselves (Mea culpa), Marks even takes a look at an unpublished Boucher novel, The Case of the Toad-in-the-Hole. I recommend this book to all fellow mystery enthusiasts and Anthony Boucher fans. I wanted this book for over a year now, but refrained from buying it in fear of spoilers and it seems that fear wasn't entirely unjustified. That's a problem I have with a lot of critical works: they spoil the solution without a warning and the reason why I read so little of them as possible. 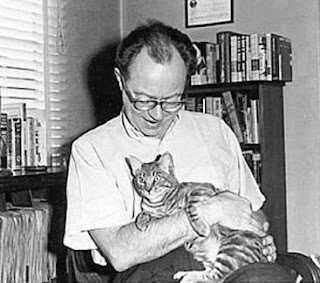 But I absolutely love and adore the picture of him with his cat! 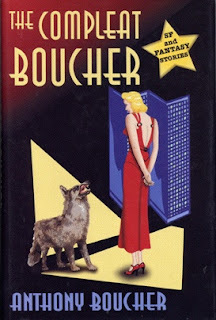 I first encountered Boucher via a fantasy/sf book called THE COMPLETE WEREWOLF. There's a horror story in it called THEY BITE, which haunted me for years afterwards, and I tended to think of him in terms of that genre for years afterwards. When the Rathbone series started to turn up on audio tape in the UK in the 80s/90s I realised how versatile an author Boucher was. There are some absolute corkers amongst the surviving episodes. I particularly like the one about Holmes during the great hiatus, solving a crime for the Dalai Lama. I picked up a Black Box thriller anthology of four of his detective novels, and loved it. Since then I've picked up his remaining novels when I find them. My favourite is probably THE CASE OF THE BAKER STREET IRREGULARS. There's a lovely humorous, civlised quality to his work that I find very appealing (as with Carr and Crispin). One of these days I'm going to have to get THE SEVEN SNEEZES and the radio script books one of these days. There was an unpublished BOUCHER? In that case, avoid Joshi's study of Carr. It's mercilessly spoiler-filled. This book is competently written and usually avoids spoilers except for those two books I mentioned. I have had to pleasure of hearing Boucher's voice, and it's just brilliant. Like Carr's voice, it sounds like the kind of guy you'd love to just sit down and have a chat with. Yes, an unpublished Boucher. It took me aback too. I thought it was going to be a sad story of a lost manuscript, too, but as it turns out, Marks gives it a pretty thorough look and a copy is probably still floating around. Whether it's publishable or not, I haven't the slightest idea, but I'd definitely read it! I too love that Tibetan murder mystery, but my favourite is the brilliant dying message in "The Living Doll". "The Camberwell Poisoners" is also a particularly favourite, with a really neat way of deducing the killer. 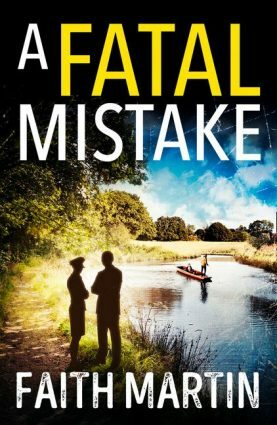 One thing is certain: Marks' book has left me intrigued for Boucher's non-mystery fiction! Yes, I read that the manuscripts still exists and probably requires a thorough editor to go over the text before it can be shoved off to the printers, but otherwise there's really no reason why it shouldn't be published – except a lack of interest from publishers. If only Douglas Greene would make a single exception to his rule and publish one full-length novel: The Case of the Toad-in-the-Hole. There's also an unpublished Inspector Cockrill novel by Christianna Brand, entitled The Chinese Puzzle, that's just waiting to be picked up. Doug Greene does excellent work with the short stories, but when I hear of unpublished novels like this, it makes me want to crawl over and commence grovelling. Patrick, I’m truly sorry if I gave way too much in 7 Sneezes! It’s never my intention to spoil books for others. My goal is to introduce some of my favorite authors to people, and what’s the point of doing that AND then giving away all the stories. I’ll have to check on that sentence. I always find it impossible that 7 to 8 pairs of eyes look at a manuscript and all miss the same thing, but it happens. Perhaps it could be corrected in the slow moving process of making it an ebook. Regarding the structure, I struggled with how best to handle it. How do you record the life of a man who was both a workaholic and a multi-tasker? It was hard to get a handle on, because I either had to split up the topics or keep about 4 different threads of his life all going at the same time and hope that the reader could keep track of them all. I did err slightly on the side of retelling some items, just to remind the reader who might have come across them 50 pages earlier in the book. It's more than a rumor about Toad-in-the-Hole. I've read the book, which is in the Lilly Library at IU. It's all right, Jeffrey- things like that (unfortunately) happen on occasion. The irony of the situation (finally finding the book only to have it spoiled days later) sort of got to me at first, but you did a very good job avoiding major spoilers of the sort for Boucher's other work. Ah, how I wish I could read "Toad-in-the-Hole"! (Unfortunately, that doesn't look like it'll happen anytime soon.) Boucher was so wonderful an author, it's hard to imagine something he wrote *not* being fun to read. I will try to locate the interrupted sentence and will post another comment if/when I do. As for the structure, I felt I should point out the moments of "deja vu", but that aside, I think you handled it well. As you say, Boucher did so much in his lifetime that it was probably best to tackle each strand individually! I found it on page 26, at the very end of the fourth paragraph.